Back in Michigan and recovered from my trip to Tucson to help with Vatican Observatory Foundation's 2019 Faith and Astronomy Workshop (#FAWVOF), only to be thrust into face-biting arctic-like conditions for the total lunar eclipse on Jan. 20th. The shape of the weeks-long conjunction of Jupiter, Venus and the star Antares in the southeastern predawn changes drastically this week, as Venus moves away from Jupiter and Antares. Venus appears to move away from Jupiter, and Saturn appears a little higher each morning. A dance of planets and stars. Animation showing the southeastern predawn sky for the Jan. 22-28, 2019. Credit: Stellarium / Paint.Net / Bob Trembley. Venus was simply brilliant all week at the FAW! You may note how it's getting just a little brighter each morning at 7:00 AM; this fact is not missed by my parrots - who scream for attention at the first hint of morning's light. A waning gibbous Moon appears near the star Regulus in the predawn sky on Jan. 22nd and 23rd. Waning gibbous Moon near the star Regulus, in the western predawn sky, Jan 22, 2019. Credit: Stellarium / Bob Trembley. Waning gibbous Moon on the other side of the star Regulus, in the western predawn sky, Jan 23, 2019. Credit: Stellarium / Bob Trembley. An almost third quarter moon appears near the star Spica high in the southwestern predawn sky on Jan. 26th. Waning gibbous Moon near the star Spica, high in the southwestern predawn sky, Jan 26, 2019. Credit: Stellarium / Bob Trembley. Mars appears high in the southwestern sky after sunset all week. Mars is high in the southwestern sky after sunset all week. Credit: Stellarium / Bob Trembley. The Sky - Just Look Up! One of the things Br. Guy mentioned at the FAW was "Just go outside and look up!" I've heard this stated many times at meetings of the Warren Astronomical Society; it's become second nature for me - I catch myself looking up every time I leave a building. Wherever you are, whenever you are, just look up! Predawn sky Jan. 2019 Credit: Stellarium / Bob Trembley. With the total lunar eclipse behind us, the Moon is a waning gibbous, rising after sunset, appearing high in the sky after midnight, and visible to the southwest after sunrise. The Moon will be at third quarter on Jan. 28th, rising around midnight, and visible to the south after sunrise. The Moon from Jan. 22-28, 2019. Visualizations by Ernie Wright. It appears that several persons captured video of an impact on the Moon during the eclipse! It's being talked about on Reddit. Possible meteor impact on moon during Eclipse? The northern coronal hole seems to have diminished to practically nothing. 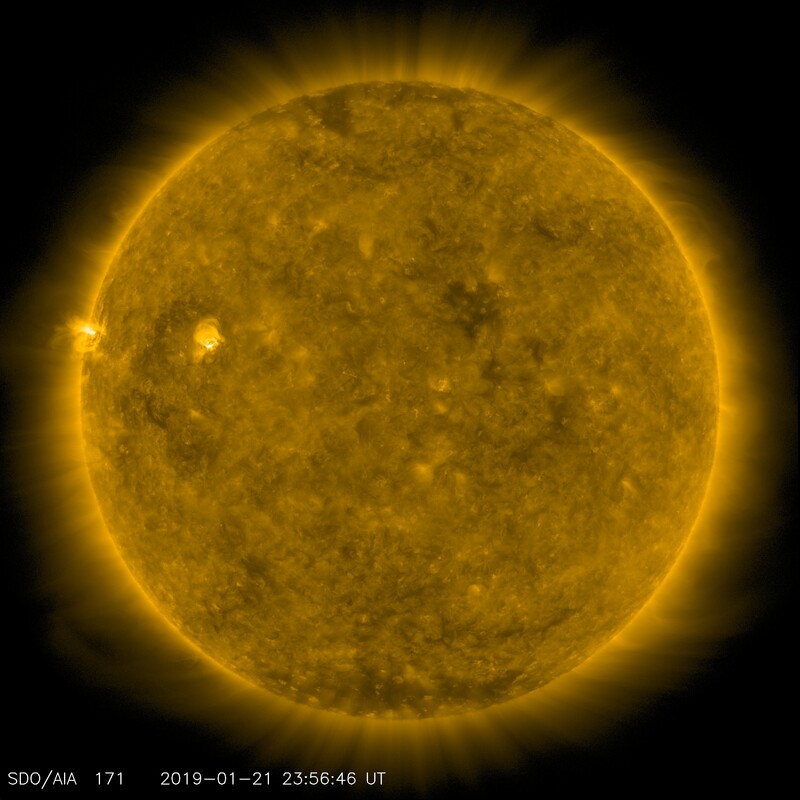 A loosely connected string of coronal holes is stretching across the Sun's southern hemisphere. There is small sunspot, AR2733, with a fair amount of coronal loop activity near the equator. Sunspot AR2733. Courtesy of NASA/SDO and the AIA, EVE, and HMI science teams. WOW! Just WOW! LOOK at that beautiful HUGE prominence at the lower right! The solar wind speed is 312.3 km/sec (↓), with a density of 3.8 protons/cm3 (↓). On Jan. 21, 2019, the NASA All Sky Fireball Network reported 10 fireballs. 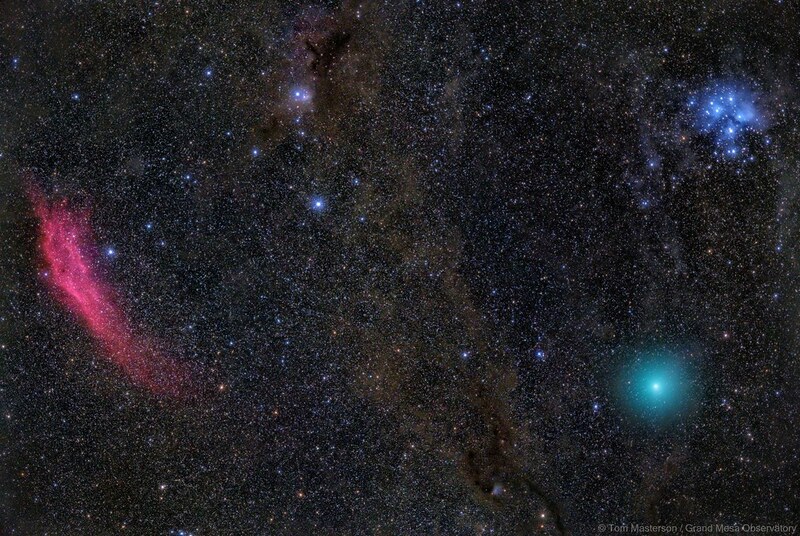 The Fiery Red California Nebula, Deep Blue Pleiades and a Green Comet 46P Wirtanen - featured in APOD 12/20/2018. Credit: Tom Masterson, Grand Mesa Observatory, Whitewater (Purdy Mesa) Colo., U.S.A. This is the position of the planets and a couple spacecraft in the solar system. Position of the planets in the inner solar system, Jan. 22, 2019. Credit: NASA Eyes on the Solar System / Bob Trembley. Position of the planets in the middle solar system, Jan. 22, 2019. Credit: NASA Eyes on the Solar System / Bob Trembley. Position of the planets in the outer solar system, Jan. 22, 2019. Credit: NASA Eyes on the Solar System / Bob Trembley. Hubble Space Telescope - Back in Operation! Wide Field Camera 3 was brought back to full operational status and completed its first science observations just after noon EST today. 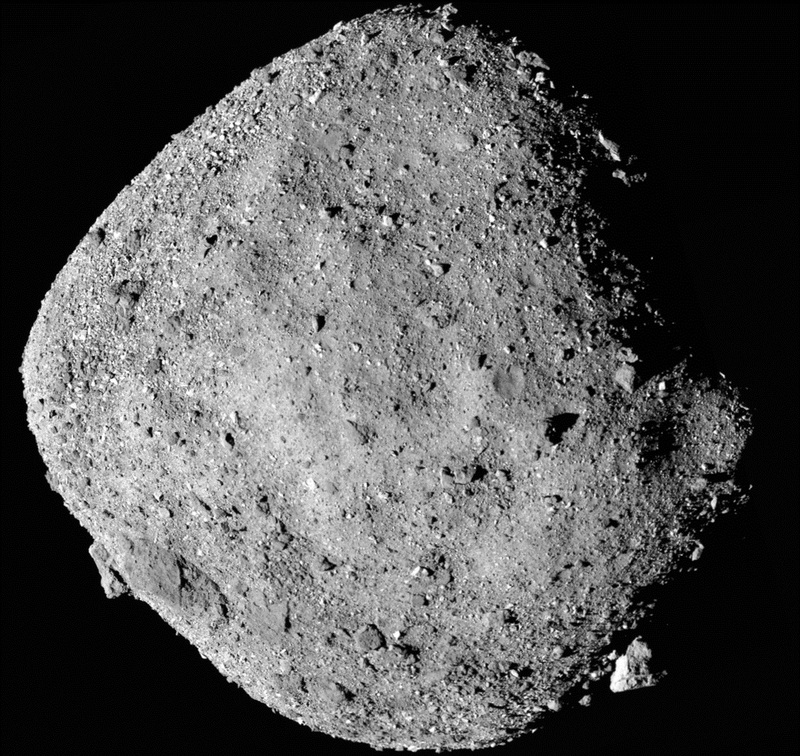 NASA's OSIRIS-REx in close orbit of asteroid Bennu. Credit: NASA Eyes on the Solar System / Bob Trembley. This animation shows how glaciers in Sikkim in northeast #India have changed between 2000 & 2018. It was created with images from the NASA/USGS #Landsat 7 mission and from @CopernicusEU #Sentinel2. While I was at the FAW, I showed a couple people this Virtual Reality app from NASA that gives you a tour of the TRAPPIST-1 exoplanet system. I have friends who work at Fermilab, and neutrinos are weird and cool! You'll have to forgive the graphics and animations in "Powers of Ten" ... it was made in 1977. I included "Powers of Ten" in my post "The Scale of the Universe" from 2015 - that post has several newer versions of a zoom-out to the edge of the universe - including the one from the movie CONTACT, which I just love!